Antiques Trade Gazette is a weekly UK newspaper that was founded in 1971. The newspaper is focused on providing information on antiques, collectibles and fine art. 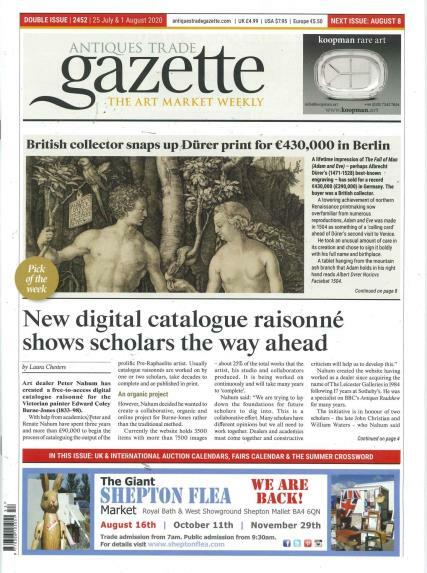 Buy a single copy or subscription to Antique Trade Gazette magazine. The publication is geared toward serious collectors and buyers of antiques. Antiques Trades Gazette has a well earned professional reputation for containing the best in the news about antiques, their value and the market on an international basis. The publication contains news about upcoming antique shows, events, museum shows, and auctions in Great Britain and around the world. There is also current market analysis of the most collectible antiques from furniture, to quality art and collectible pieces. You will find news on a variety of antique genres including Asian antiquities to fine English antiques. Antiques Trade Gazette also covers antiques in the emerging antique markets of Russia, China and India. There is even news on stolen antiques.